Microsoft provides free tool for Windows 7 users to burn a .iso file onto a usb drive or onto a dvd drive. This tool can be really useful when you do have a .iso file containing an operating system or something else. Just download this free tool from Microsoft website and create a bootable usb drive or dvd drive with the bootable .iso file. The .iso file format is well recognised and Microsoft is even going to provide in built integration in Windows 8. The tool presented above will provide you quick and easy way to create a bootable usb drive or even a bootable dvd drive. 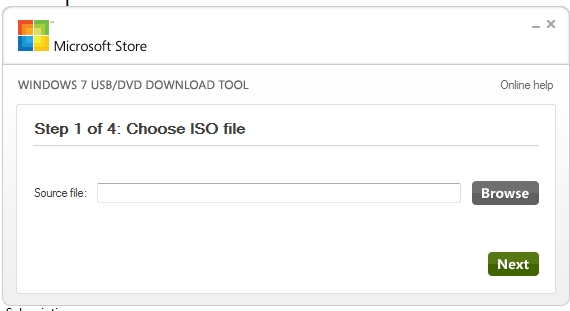 Make sure the size of the DVD or the USB drive is bigger than the size of the .iso file and yes this free tool from microsoft will format the usb drive before copying the contents onto the usb drive and hence making it bootable. Once you have a bootable usb drive or a dvd drive, you might wish to have a look at the target computer’s boot order in bios settings. During installation of the operating system onto the target computer, you will have to remove the bootable usb or dvd drive so that setup in the hard disk can continue.